Property prices are on the rise all over the world and Pakistan real estate is no exception, as in recent years property values have picked up manifold in all the major cities of Pakistan. Both commercial and residential projects in Lahore, Karachi, and Islamabad remained a prime target for local investors and also for overseas Pakistanis from Europe, United States, and Middle East. According to Zameen.com’s real estate stats, the real estate sector of the country remained successful in sustaining a steady upward trend during the past one year. It is also believed that the pro-business mindset of the Pakistan Muslim League–Nawaz (PML–N) government turned out to be a catalyst for real estate growth. Zameen.com also noticed that the interest of investors in real estate projects increased during the first year of the PML–N government. 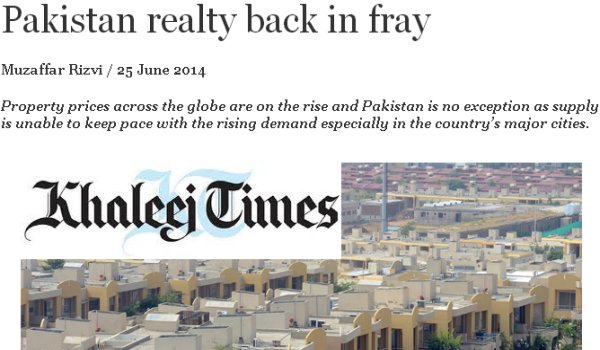 The portal expects that the property market is likely to flourish further in the time after the holy month of Ramadan.